Jake Dunn of Fairfield just completed a stellar career at Division II Kenyon College. Dunn finished as the Lords all-time leader in hits, runs scored, at-bats, doubles and total bases. The numbers. You can't help stop at stare at the numbers. They jump out at you, shake you by the collar and scream at you to look at them. Amazing, huh? Career hits leader. Career at-bats leader. Career runs scored leader. Career total bases leader. Career doubles leader. And with each game over his senior season, Jake Dunn kept adding to those totals. 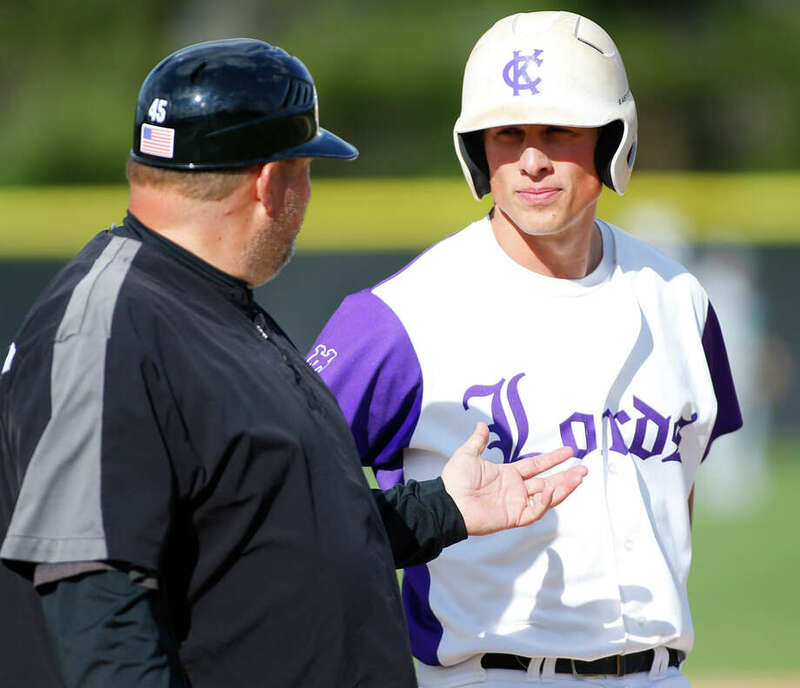 "He's been tremendous," says his Kenyon College baseball coach, Matt Burdette. "Probably the best we've ever had here, to be honest with you, in terms of the numbers, no doubt." Dunn, who grew up in the shadows of Brooklawn Country Club in Fairfield, came to Kenyon as a slightly jittery shortstop who eventually moved to center field and over the next three-plus years, established himself as one of the best players in Kenyon College baseball history. A total of 228 hits, 570 at-bats, 169 runs scored, 59 doubles, 330 total bases, all Keynon records. Just another day at the office for Jake Dunn. "I don't really worry so much about the records, I'm just fortunate to my bonded over these last four years with my teammates and had such an incredible experience," he said. "It's been an incredible four years playing here. Coach Burdette has been great ... I couldn't ask for a better college experience. I'm really fortunate to have played here." After falling to Ohio Wesleyan 6-5 on May 3 to end its season, the Lords finished with a 21-19 record. Dunn went 0 for 6, just the fifth time he went hitless in a game this season. He ended with 64 hits in 145 at-bats (a .441 average), 42 runs scored, 16 doubles, three triples, three homers, 24 RBI and 16 stolen bases. "Jake is such a tremendous worker. You knew the talent was there, that was evident when I went to see him play in high school. He could run, he could throw, he could hit with power. He had all the stuff that you look for in a baseball player," Burdette said. "But one thing you don't know about him is just how dedicated he is to the craft. It was apparent from the moment Jake got on campus that he was going to do whatever it took, work ethic-wise, to be the guy that wanted to play all the time and was going to be productive and do all the things necessary to become a championship player." Dunn grew up in the Greenfield Hill area and attended Fairfield Country Day School and started playing baseball in the Fairfield Little League and Babe Ruth programs. Later, the family moved to Old Oaks Road near Brooklawn. But rather than attend nearby Warde, Dunn opted for boarding school, attending St. George's School in Newport, Rhode Island, where he played football, basketball and baseball and eventually caught the eye of Burdette. And once Dunn saw Kenyon, located in Gambier, Ohio, it was love at first sight. "It was the academics that drew me to Kenyon," Dunn said, who's majoring in political science. "I was looking at some other schools like Amherst and Trinity and when I got here I fell in love with the place. It's beautiful and its academic reputation is incredible. I knew right away it was the best fit for me." Fortunate to play right away as a freshman, Dunn started at shortstop and admittedly struggled with the position. "I wasn't a great infielder, honestly, I really struggled a lot in the infield but my teammates helped me push through that," he said. "When I moved to the outfield toward the end of my freshman year, it ended up being my best position. It was a pretty easy transition. Since then, I've played pretty much in center field these past three years." And when he's not in the outfield, Dunn is in the batting cage, working on his hitting. A big part of his success, he claims, comes from former Bridgeport Bluefish manager and major leaguer Willie Upshaw, who is a hitting instructor at The Clubhouse in Fairfield. "I've been working with Willie for about two years and he helped me hone in on with little intricacies of my swing," Dunn said. "He's helped me become more of a complete hitter. It's developed from the first day I worked with him and I've become a much better hitter because of him. If I model my swing after anyone it's Willie because I've worked with him these last two years." Dunn also credits Pat Hall and Brian Huber, who are coaches with the Connecticut Blue Jays AAU team, along with the instructors at The Batting Cage who his development. Dunn will graduate in May with his degree and is looking to go to the Tuck Business program at Dartmouth this summer. Last summer he worked as an intern for Major League Baseball in the marketing department, doing web design work and over Christmas break he interned for the Wasserman Group. The business world is the future ... unless baseball gets in the way. "I think most definitely he does have a shot (to keep playing baseball)," Burdette said. "I wouldn't be shocked to see him taken in the Major League Baseball draft in June. He seems to be on the minds of quite a few teams. We've had organizations contact us, multiple major league affiliations, scouts watching. He definitely has the skill set, the mind set and the work ethic to be a guy that I think deserves a shot." And if he gets that shot? "I'm going to wait and see," Dunn said. "I just want to enjoy these last games and have fun."